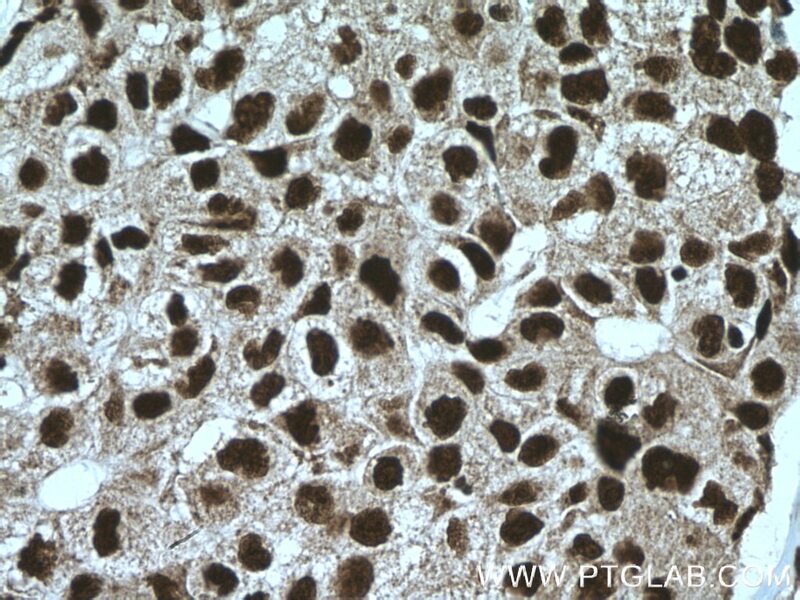 Immunohistochemical analysis of paraffin-embedded human lung cancer tissue slide using 12176-1-AP (FAM107A antibody) at dilution of 1:200 (under 10x lens) heat mediated antigen retrieved with Tris-EDTA buffer(pH9). 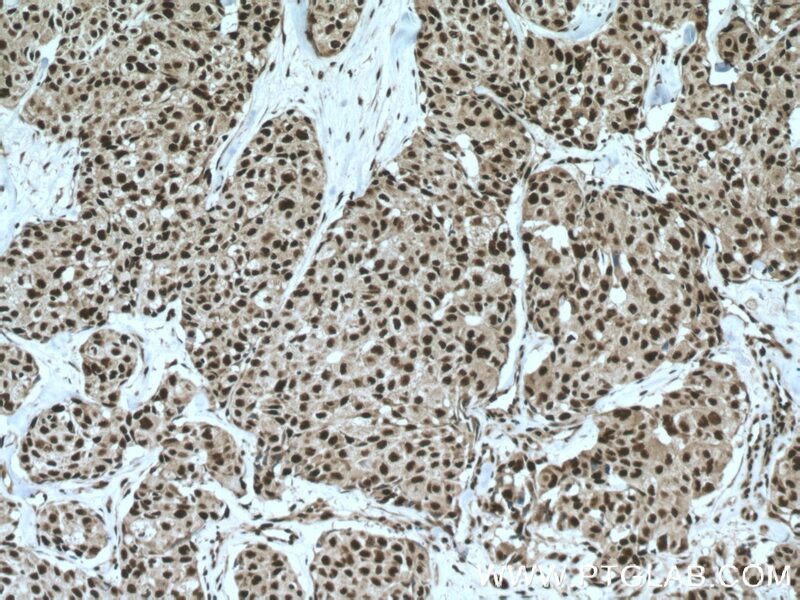 Immunohistochemical analysis of paraffin-embedded human lung cancer tissue slide using 12176-1-AP (FAM107A antibody) at dilution of 1:200 (under 40x lens) heat mediated antigen retrieved with Tris-EDTA buffer(pH9). 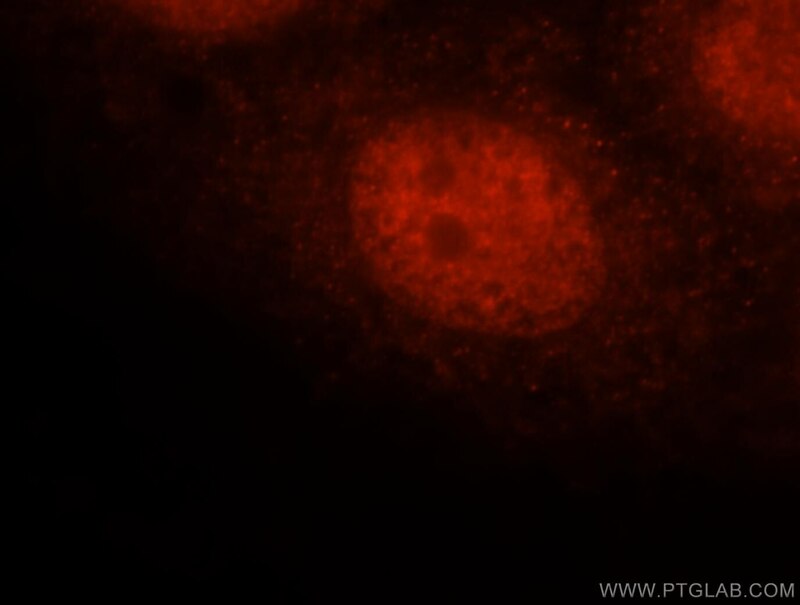 Immunofluorescent analysis of MCF-7 cells, using FAM107A antibody 12176-1-AP at 1:25 dilution and Rhodamine-labeled goat anti-rabbit IgG (red). FAM107A, also named as TU3A, encodes a 144 amino-acid protein, which contains a coiled-coil domain and a nuclear localization signal. FAM107A as a transcription factor regulates some gene transcription and signal transduction in cell. With the exception of peripheral blood cells, FAM107A is widely expressed in normal tissues, but shows significant loss of expression in renal cell carcinomas and frequent loss of expression in cervical, gastric, ovarian and non small cell lung cancers. Transfection of FAM107A mRNA into cancer cell line inhibits cell growth and proliferation, supporting the evidence that the gene functions as an important tumor suppressor. A severe mouse model of spinal muscular atrophy develops early systemic inflammation.